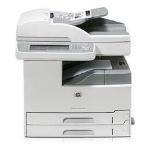 HP LaserJet M9050 Expert Reviews - Read Reviews and Buy Smarter Online. Verdict: The icing on the cake is the 9050dn's paper handling, starting with the 300,000-page-per-month duty cycle. The printer handles up to tabloid-size paper, includes a duplexer, and offers a capacity of 1,100 sheets. Perfect printer for large print jobs. Verdict: Great industrial printer. Seller was great to work with!! Verdict: According to the HP website, this printer is not color (b&w only). "High volume printing at its best"
Verdict: When I was told we were to receive 3 of these I couldnt believe my ears. Straight from the box, well the crate anyways the obvious advantages of using recognised manufacturers machines became apparent. Within 45 minutes all 3 machines were ready to go and configured for network printing. Verdict: Really disappointed with this product. We have only had it a few months and get constant errors, at present it isn't usable, and feels like a complete waste of money. I have tried contacting the seller to ask for advice on fixing / making it usable, no response.